Today we released a handful of new features for everyone to enjoy. First off, we’ve added the ability to add notes/comments to all Accounts, Contacts, Bookings, and BEOs. Notes are organized with the most recent note at the top of the list. Notes are only editable and deletable by the person who created the note – or by an admin. 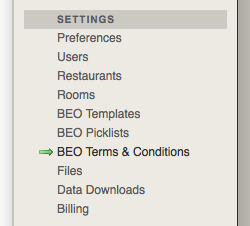 Next, we’ve added a new area under settings to create and edit BEO Terms & Conditions, as pictured on the right. As an aside, the editor for the Terms & Conditions allows for some amount of formatting (italicize, bold, headlines, etc.). Once entered into the settings area, a drop-down list will show up above the Terms & Conditions field on the BEO screen, as seen below. Select one from the drop-down list and it will populate the Term & Condition field. Wa-la!